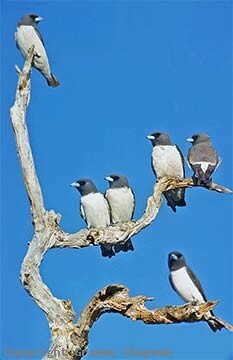 White-breasted Woodswallows occur widely across northern Australia, particularly in Queensland but they do extend down through central NSW into northern Victoria where they are mainly seen in close proximity to water. 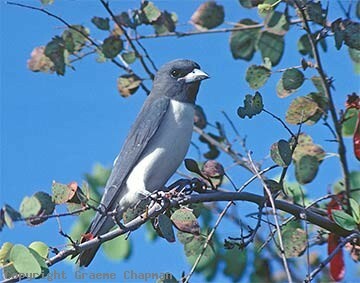 These southern populations tend to be migratory and head north in winter. 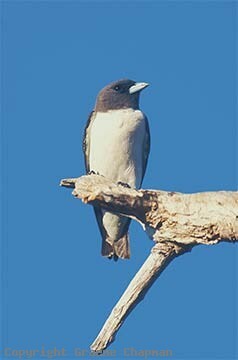 Outside Australia, White-breasted Woodswallows are widespread throughout the tropics from the islands of the SW Pacific to New Caledonia, New Guinea and as far away as the Phillipines. They mainly breed in pairs, but on occasions up to five birds have been seen attending a nest. More notable is their roosting behaviour. 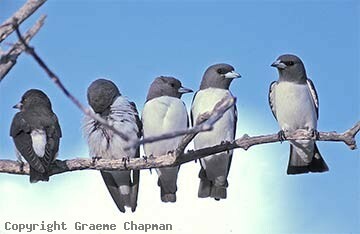 Unlike the dark coloured woodswallows in Australia which all roost in a tight cluster, White-breasteds sit in close contact in long lines (see pics #543206, 543209-211). Where this habit is very easy to see is at Townsville in Queensland where the birds use overhead power lines - I've seen in excess of 50 birds in a line there on occasions.